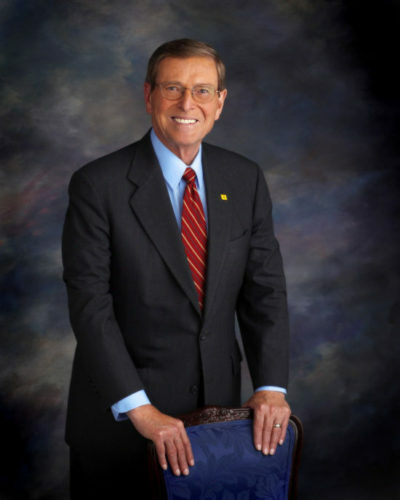 One of the first issues that Pete Domenici concerned himself with was waterway usage fees, in spite of his state lacking any waterway capable of commercial traffic. The idea behind a waterway usage fee was that the Army Corps of Engineers built dams and other expensive waterway projects, which the barge industry were able use for free. In 1977, Domenici set himself to the task of enacting a waterway usage fee. After a long two-year battle with stiff lobbying on both sides, the waterway fee was finally passed along with a new lock and dam project (the rebuilding of Lock and Dam 26.) Reporters attributed the passage of this fee in no small part to Domenici’s legislative skill. The legislation was signed into law in 1978. The issue greatly assisted Domenici in his home state, where the railroad industry was a significant player (railroads competed with barges, and they long wanted to end the “free ride” issue).The railroads donated $40,000 to Domenici’s campaign, and the barge industry gave a small sum to his opponent. He was reelected in 1978 with 53.4% of the vote over Democrat Toney Anaya, a former New Mexico Attorney General. The 6.8% victory margin would be Domenici’s closest election in his Senate career. Pete Domenici was subsequently re-elected in 1984, 1990, 1996, and 2002 and is to date the longest-serving senator in his state’s history, having served in the legislative body for 36 years. At the time of his retirement, he was the ranking member of the United States Senate Committee on Energy and Natural Resources and the United States Senate Appropriations Subcommittee on Energy and Water Development. He was also a member of the U.S. Senate Committees on Appropriations and Indian Affairs, and served as Chairman and Ranking Minority Member of the Budget Committee. He advocated for the mentally ill, having pushed the Mental Health Parity Actof 1996. In 1998, Pete Domenici voted to impeach President Bill Clinton during the revelation of his affair with Monica Lewinsky. He explained his vote: “What standard of conduct should we insist our President live up to? … Do not underestimate, my friends, the corrupting and cynical signal we will send if we fail to enforce the highest standards of conduct on the most powerful man in the nation.” During the 1970s, Domenici had fathered an illegitimate child with Michelle Laxalt, a 24-year-old Republican staffer and lobbyist, the daughter of Republican Senator Paul Laxalt. The child was not publicly acknowledged by Domenici until 2013. In 2013, Domenici, then 80, acknowledged the affair and his son, saying he was “very sorry” for his behavior. The son, Adam Laxalt, ran for Attorney General of Nevada in the 2014 election and defeated Democrat Ross Miller. Pete Domenici has been an avid proponent of nuclear power and published two books on the subject: A Brighter Tomorrow: Fulfilling the Promise of Nuclear Energy (Lanham, Maryland: Rowman & Littlefield Publishers, 2004), which he wrote; and Advanced Nuclear Technologies — Hearing Before the Committee on Appropriations, U.S. Senate (Collingdale, Pennsylvania: D I A N E Publishing Company, 1999), which he edited. Pete Domenici died aged 85 on September 13, 2017 at the University of New Mexico Hospital in Albuquerque, New Mexico from complications that resulted from abdominal surgery. His funeral was held on the morning of September 16 in Albuquerque.